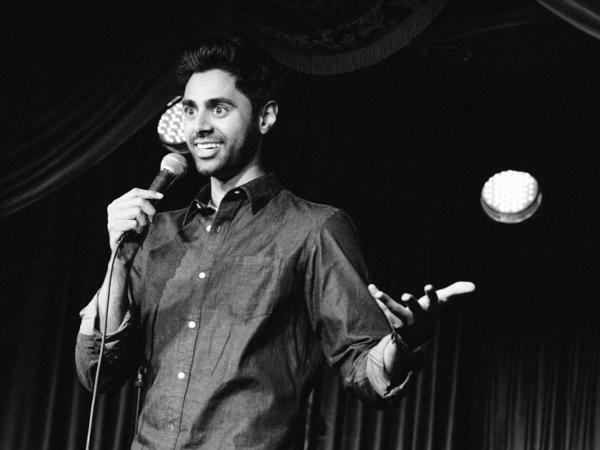 Hasan Minhaj performs in his new one-man show "Homecoming King". Hasan Minhaj was one of Jon Stewart's last hires on The Daily Show. As a correspondent, he's covered Pope Francis' recent visit to the U.S., labor issues and negotiations with Iran. On the side, he's been working on a solo theater piece called Homecoming King that gets its New York premiere off-Broadway at the Cherry Lane Theater on Thursday. Homecoming King is a roller-coaster ride. Onstage, Minhaj is a charming, energetic comedian and an absorbing storyteller. He talks about how his white friends acted at his traditional, Indian wedding. "I don't know if you guys know this but, whenever you guys go to anything remotely ethnic, you guys act like you're on molly. Like all of my white friends were losing their minds at my wedding. They would be like 'Oh my god Hasan. Oh. Oh. The colors! Oh. The colors!" He talks about visiting relatives in India. "I feel like the rapper that made it. Like, this is what I go back to. And I'm just like, 'This is how you guys are living? What? Yo, when Hasan's here everybody eats, son, everybody eats. Capri Suns on me, fam. Gushers on me, fam. Fruit Roll-Ups on me. You're welcome. They're losing their minds over stale Oreos. 'Oh my god, Hasan, it's one cookie, but now it's two.' And I'm like, 'I'm not even gonna give you a Thin Mint. You will s*** your pants." Minhaj grew up in Davis, Calif. After he was born, his mother returned to India to finish medical school. For the first eight years of his life, it was just him and his dad, he says. "We were basically two brown dudes trying to make it in America. He's trying to navigate being the only brown guy at his work. He's this single guy, but he's married. And he has this kid, this son he's raising. And I'm navigating growing up in this sea of white. I'm this one brown speck in my class photo." Millions of Americans can relate to the immigrant and first generation experience, says Minhaj. "This first generation narrative keeps happening over and over and over again. Whether it was Irish or Jewish or our community, South Asians, Japanese-Americans, Mexican-Americans. We've all gone through this sort of bridge and it will continue to happen." Minhaj's dad was strict and fearful of American high school traditions. Minhaj says he wasn't allowed to go to movies or football games. One of his good friends — a white girl named Bethany Reed — asked him to the prom. In Homecoming King, Minhaj translates his dad's response thusly: "Hasan I will break your face." But, like a good, American teenager, Hasan went anyway. He put on his JC Penney suit, snuck out and rode his bike over to his date's house. "And I'm making sure I'm biking extra wide with my knees out. That way my slacks don't get caught up in my bike chains." "'See, we have a lot of family back in Ohio, and we're going to be taking a lot of pictures tonight, and they're going to see them. And we don't know if it would be a good fit for us. Do you need a ride home? Mr. Reed can give you a ride home.' And I said, 'No, I'm OK. I have my bike.' And I biked home and I snuck back into my room and I just played Mario Kart for the rest of the night. And that's the best I've ever been dressed playing Mario Kart." When Jessica Pilot, who directs a Web series for The Village Voice called This Is Stand-Up, saw Homecoming King, she was surprised at how personal the experience felt. "We're not just hearing it. We're seeing and we're almost feeling it because Hasan Minhaj is a great storyteller," she says. Minhaj first told his prom story for a live event for The Moth. He says he heard from all kinds of people who said they'd experienced the same kind of rejection, and thanked him for finding the humor in it. "I realized that, in life, whenever I've shared these stories, both laughter and sadness were essentially one and the same," he says. Earlier this year, when Minhaj performed Homecoming King at the annual comedy festival in Montreal, the audience was right there with him, in tears of both laughter and pain. One of Jon Stewart's last hires on "The Daily Show" was comedian Hasan Minhaj. HASAN MINHAJ: That's a great idea, which leads me to my next segment - Minhaj's Muslim Makeover. MCEVERS: On the side, Hasan Minhaj has been working on a solo theater piece called "Homecoming King." It gets its New York premiere tomorrow night off-Broadway at the Cherry Lane Theater. As NPR's Elizabeth Blair reports, it's based on his life growing up the son of immigrants from India. ELIZABETH BLAIR, BYLINE: "Homecoming King" is a rollercoaster ride. On stage, Hasan Minhaj is both energetic comedian and absorbing storyteller. He talks about how his white friends acted at his traditional Indian wedding. MINHAJ: They're like, oh, my God, Hasan, oh, the colors, the colors, oh, oh. BLAIR: He talks about visiting relatives in India. MINHAJ: I feel like the rapper that made it. Like, this is what I go back to, and I'm just like, yo, this is how you guys are living. What? Like, yo, when Hasan's here, everybody eats, son. Everybody eats. MINHAJ: Capri Suns on me, fam, Gushers on me, fam, Fruit Roll-Ups on me. You're welcome. Like, they're loosing their mind over stale Oreos. They're like, oh, my God, Hasan, it's one cookie, but now it's two. I'm like, I'm not even going to give you a Thin Mint. You will [expletive] your pants. BLAIR: Minhaj grew up in Davis, Calif. After he was born, his mother returned to India to finish med school. For the first eight years of his life, it was just him and his dad. MINHAJ: We were basically two brown dudes trying to make it in America. And he's trying to navigate, you know, being the only brown guy at his work - you know, the single guy, but he's married. And then he has this kid, this son that he's raising. And I'm navigating, you know, growing up in this just sea of white on this one little brown spec in my class photo. BLAIR: Minhaj's dad was strict and fearful of American high school traditions. Minhaj says he wasn't allowed to go to movies or football games. One of his good friends, a white girl named Bethany Reed, asked him to the prom. MINHAJ: So I was like, Dad, can I go to prom? And he was like, Hasan, (speaking Hindi), which means, Hasan, I will break your face. BLAIR: But like a good American teenager, Hasan went anyway. He put on his JCPenney suit, snuck out and rode his bike over to his date's house. MINHAJ: And I'm making sure I'm biking extra wide with my knees out. That way, my slacks don't get caught up in my bike chains. BLAIR: Minhaj says he felt like he was living the American dream on that bike ride until he got to the girl's house. When the front door opened, another boy was putting a corsage on Bethany. Her mother explained. MINHAJ: See, we have a lot of family back in Ohio, and we're going to be taking a lot of pictures tonight. And they're going to see them. And we don't know if it'd be a good fit for us. Do you need a ride home? Mr. Reed can give you a ride home. And I said, no, I'm OK. I have my bike. And I biked home, and I snuck back into my room. And I just played Mario Kart for the rest of the night. And that's the best I've ever been dressed playing Mario Kart. JESSICA PILOT: It was just a very personal experience. I was surprised. BLAIR: Jessica Pilot writes about comedy for the Village Voice, where she also directs a web series called "This Is Standup." She's seen "Homecoming King." PILOT: We're not just hearing it. We're seeing it, and we're almost feeling it because Hasan Minhaj is a great storyteller. 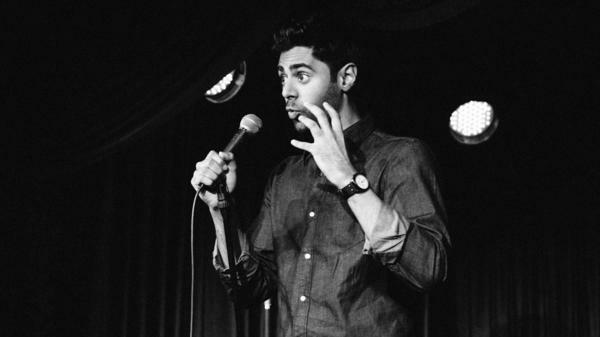 BLAIR: Hasan Minhaj first told his prom story onstage for the public radio show The Moth. He says he heard from all kinds of people who said they'd experienced the same kind of rejection and thanked him for finding the humor in it. MINHAJ: I realize, like, in life, whenever I've shared these stories with people, both, like, laughter and sadness were essentially one in the same. BLAIR: Earlier this year when Hasan Minhaj performed "Homecoming King" at the annual comedy festival in Montreal, the audience was right there with him in tears of both laughter and pain. Elizabeth Blair, NPR News. Transcript provided by NPR, Copyright NPR.